Markets regulator Securities and Exchange Board of India (SEBI) on Thursday said retail investors applying for shares in IPOs would need to be compensated if bankers fail to make the allotment despite their eligibility. Besides, the public issue banker would need to pay an interest amount of 15 per cent to the investors for failing to resolve the grievance within 15 days, while they may also face Sebi's action for such failures. Putting in place a framework to compensate retail investors who fail to get securities in an IPO, Sebi said there should be a uniform policy for calculation of minimum compensation payable to investors. 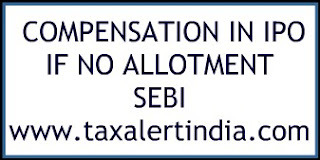 While calculating minimum compensation, several factors need to be taken into account like opportunity loss suffered by the investor due to non-allotment of shares; number of times the issue was oversubscribed in the relevant category; probability of allotment; and listing gains if any on the day of listing. "It is also proposed that in case of issues which are subscribed between 90-100 per cent -- that is non-oversubscribed issues --- the applicants would be compensated for all the shares which they would have been allotted," Sebi noted. However, no compensation would be payable to the applicant in case the listing price is below the issue price, it said in a circular, which would come into force with immediate effect. While the process of Applications Supported By Block Amount (ASBA) has resulted in almost complete elimination of complaints pertaining to refunds, Sebi said there have been instances where the applicants in an IPO have failed to get allotment of specified securities and in the process have suffered an opportunity loss due to failure on part of bankers to process the applications even when they have been submitted within time. Other factors are -- failure on part of the Self Certified Syndicate Banks (SCSBs) to make bids in the concerned exchange system even after the amount has been blocked in the investors' bank account and any other failures on part of an SCSB which has resulted in the rejection of the application form. "Any applicant whose application has not been considered for allotment, due to failure on the part of the SCSB, shall have the option to seek redressal of the same within three months of the listing date with the concerned SCSB. "On receipt of such application, the SCSB would be required to resolve the same within 15 days, failing which it would have to pay interest at the rate of 15 per cent per annum for any delay beyond the said period of 15 days.," Sebi noted. In case bankers fail to redress such grievances within the stipulated time, additionally "Sebi may initiate action as deemed fit".